Agency Arms Mid Line Barrel focuses on additional machining enhancements and appearance. It is constructed of 416R stainless steel with pulled broached rifling and 8 Gear flutes machined around the circumference of the barrel. Caliber information is machined on the rear, while a large Agency "A" on ..
Agency Arms Premier Line Barrel focuses on attention to every detail. It has added performance from polished feed ramp and crown to reduce friction. The barrel is constructed of 416R stainless steel with pulled broached rifling and 8 octagonal flutes machined around the circumference of the barrel. 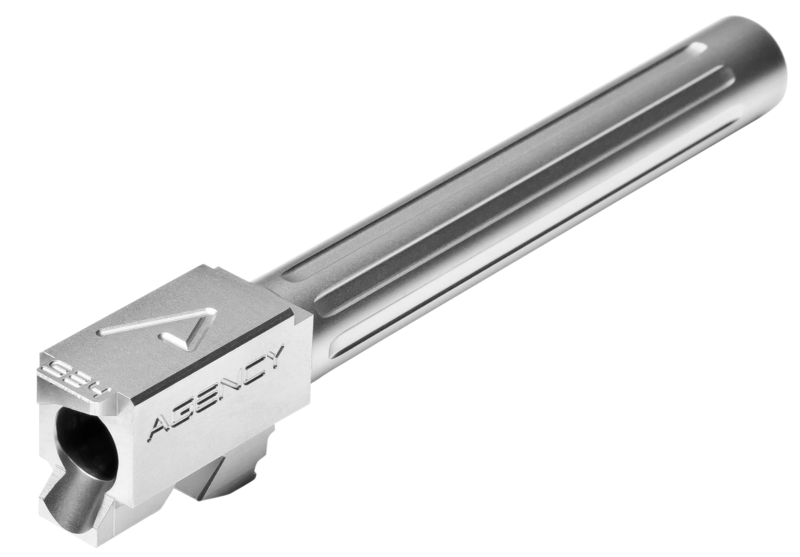 ..
Agency Arms Standard Line Barrel focuses on functionally. It is constructed of 416R stainless steel with pulled broached rifling. Caliber information and a subtle Agency "A" are machined on the rear of the lockup. 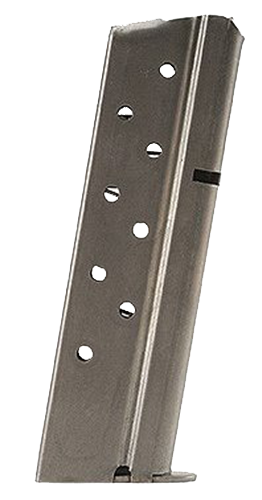 This non-threaded model is compatible with Glock 17 and has a stainless steel finish a..
Agency Arms Standard Line Barrel focuses on functionally. It is constructed of 416R stainless steel with pulled broached rifling. Caliber information and a subtle Agency "A" are machined on the rear of the lockup. This threaded model is compatible with Glock 17 and has a stainless steel finish with ..
Agency Arms Standard Line Barrel focuses on functionally. It is constructed of 416R stainless steel with pulled broached rifling. Caliber information and a subtle Agency "A" are machined on the rear of the lockup. This non-threaded model is compatible with Glock 19 and has a stainless steel finish a..
Agency Arms Standard Line Barrel focuses on functionally. It is constructed of 416R stainless steel with pulled broached rifling. Caliber information and a subtle Agency "A" are machined on the rear of the lockup. 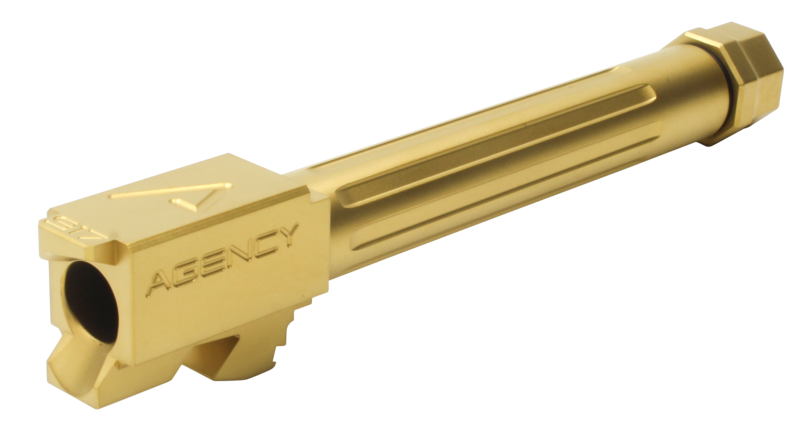 This non-threaded model is compatible with Glock 19 and has a Titanium Nitride (gold) ..
Agency Arms Standard Line Barrel focuses on functionally. 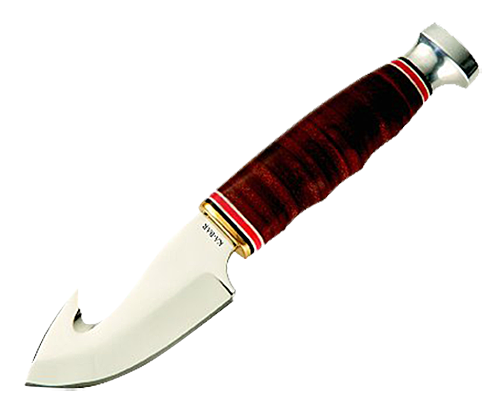 It is constructed of 416R stainless steel with pulled broached rifling. Caliber information and a subtle Agency "A" are machined on the rear of the lockup. This threaded model is compatible with Glock 19 and has a stainless steel finish with.. The Ballastics Advantage 16" .223 Wylde SPR Fluted Midlength AR 15 Premium Series Barrel is machined from 416R Stainless Steel with a bead blasted finish. 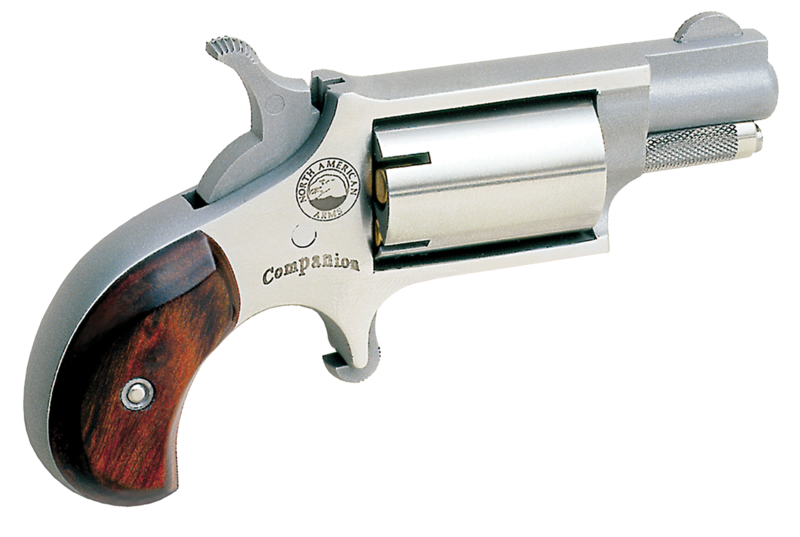 Our Premium Series Barrels feature a Nickel Boron Coated Extended M4 Feed Ramp Extension. Featuring functionally aggressive flutes and crisp, cle.. The Ballastics Advantage 18" .223 Wylde SPR Fluted Rifle Length AR 15 Premium Series Barrel is machined from 416R Stainless Steel with a bead blasted finish. Our Premium Series Barrels feature a Nickel Boron Coated Extended M4 Feed Ramp Extension. Featuring functionally aggressive flutes and crisp, .. The Ballastics Advantage 14.5" .223 Wylde SPR Fluted Midlength AR 15 Premium Series Barrel is machined from 416R Stainless Steel with a bead blasted finish. Our Premium Series Barrels feature a Nickel Boron Coated Extended M4 Feed Ramp Extension. Featuring functionally aggressive flutes and crisp, c.. The Ballistics Advantage .300 Blackout chambered 8" Performance Series Barrel is machined from 4150 Chrome Moly Vanadium steel with a QPQ Corrosion Resistant Finish. The Performance Series Barrels feature a nickel boron coated M4 feed ramp extension and are HP and MPI tested. With a DRP barrel profi..
Bushmaster''s ACR caliber conversion barrels allow the Adaptive Combat Rifle to take on new challenges, improving on functionality and modularity. With tool-less disassembly allowing quick caliber change options, the ACR is one of the most field adaptable MSR platforms. 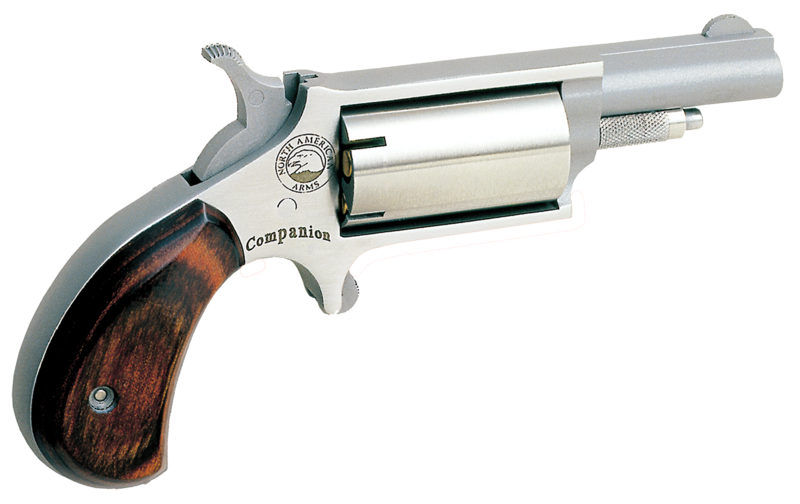 Made of FNC-treated 4150 CMV ..
Carlson''s Remington high quality accessory shotgun barrel is constructed from certified ordinance grade 4140 steel with chrome lined bore. It comes with a Carlson choke tube, and is threaded for the Rem choke style system. This Remington 870 model is 18.5" long with a satin matte blue finish, and ..